Have image editing capabilities as powerful as today's desktop-based software. One example from Clayton Christensen’s “The Innovator’s Dilemma” which remains vivid is that of the transitor. When the transitor was first introduced many people predicted that it would immediately replace the vacuum tube. This is not what happened. Instead, the early transistor failed to compete with vacuum tubes for music reproduction because the primary goal of that reproduction was audio fidelity, and transistors didn’t have it. However, when transistors were used to create small, portable hearing aids, it was a clear winner because size was the most important factor in that market. Over time the transitor, because of continuing improvements, did displace the vacuum tube. 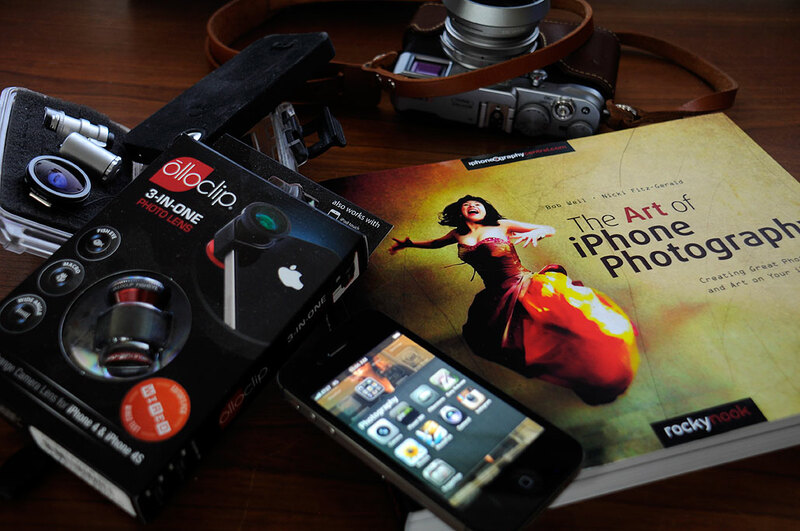 We believe that smartphones are like the transistor; and the disruption in the field of photography has already begun. In the rest of this article, we will lay out our thoughts on why we think its effects will spread quickly to the pros. When we got our Fujifilm X100S point-n-shoot, one of the observations we made was that its high-quality lens coupled with the 16.3MP APS-C size sensor gave very credible zoom and macro effects. It made us realize that, with high-enough resolution and a sufficiently large sensor, a small fixed-lens camera can capture images once only possible with an DSLR and specialty lenses. At some point, the same will be true of smartphone cameras. The resolution of smartphone cameras, like other digital cameras, have been increasing every year. Most of today’s smartphones have at least an 8MP camera. The recently announced Nokia Lumia 1020 smartphone is currently the king of the hill with a 41MP PureView camera. Photographers should not think of the Lumia 1020 as a high resolution camera. They should think of it as a FLAT zoom lens! While even most professional DSLRs does not have the kind of resolution of the Nokia Lumia, we will remind readers that it is incorrect to directly compare camera resolution of DSLRs with those of smartphones. 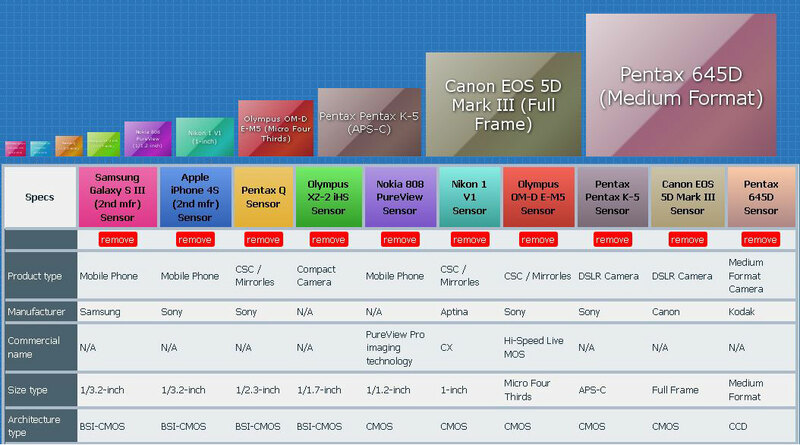 The physical size of a smartphone camera sensor is still relatively small compared to that of a DSLR. While a higher megapixel spec couldresult a higher resolution image, a small sensor size translates directly to lower light-sensitivity and greater noise. For the time being, DSLRs, with their much larger sensors, are able to produce far superior images (typically). However, the direction for smartphones is clearly toward both higher megapixel cameras and larger sensor sizes. NOTE: Go here if you want to compare different smartphone cameras. Go here if you are interested in comparing different digital cameras. The ability to choose the best lens for a particular application gives the photographer tremendous flexibility and creative control. Interchangeable lenses have long been the sole province of DSLR cameras. There is no such feature for smartphones. While accessory/add-on lenses are available, they typically extract a heavy price in terms of overall image quality. What if there was a way for smartphones to have access to quality optics similar to those available to DSLRs? This might not have been the exact question asked by Sony engineers when they created the QX series, but they might as well have. The QX line may look like lenses, but it is actually a line of cameras without the LCD screen and camera controls. The “lens” communicates with the smartphone wirelessly. Everything but the image capture will be done by the smartphone. Sony’s new QX line is one of the most refreshing ideas to come from Sony in many decades. It is nice to see them innovating again! The QX10 and QX100 “smartphone lenses” will be shipping by the end of September. The controls are now going completely touch screen and lenses may be brand/mount agnostic. How long will it be before lens makers start making prime lenses which skip the DSLR body altogether? If the Sony approach gains traction, future photographers may be able to use the smart phone/tablet to control multiple lenses wirelessly and remotely…perhaps for nature photography or sports shots difficult or impossible to achieve today. Most of the newer DSLRs now have post-capture image-editing and enhancement functions (ie: red-eye removal, contrast enhancement, etc) available directly in the camera. Smartphone cameras have had those capabilities since Day One. This is the one area where smartphones are actually ahead of conventional DSLRs. The main reason is that the large Android and iOS 3rd-party developer communities are churning out apps with sophisticated image-manipulation features for the smartphones. This is something not available to camera manufactuers, unless they follow Sony’s QX approach previously discussed. When Pranav Mistry presented his SixthSense TED talk in 2009, the device he hacked together showed an interesting vision of wearable computing. Embedded in the talk was a snippit about manipulating images on any convenient surface. With Texas Instrument’s recent announcement of their DLP pico projector chip set and a Leap Motion-like controller, Pranav’s hack may soon be realizable in a smartphone. While simple image-editing functions had been available on smartphones, sophisticated Photoshop-like manipulations are now possible on a smartphone. However, the limitation is the small screen. By embedding a pico projector and Leap Motion-like controller in a smartphone, photographers will be liberated from that display constraint. During this Winter and through 2014 we will see how far we can push the limits of iPhone photography. To start things off, we will review Rocky Nook’s The Art of iPhone Photography , the olloclip 3-In-One lens , and a few other iPhone-related photography gear later this Fall. Of course, the hardware is just part of the story. Mobile apps are and will continue to be a huge part of this emerging branch of photography. We will select a few worthy ones and do a deeper dive into those as well. It is going to be interesting! NOTE: We will use the term “iPhone photography” interchangeably with the more general term “smartphone photography.” This is because, at the present time, the iPhone has the richest ecosystem surrounding it (lenses, apps, accessories).